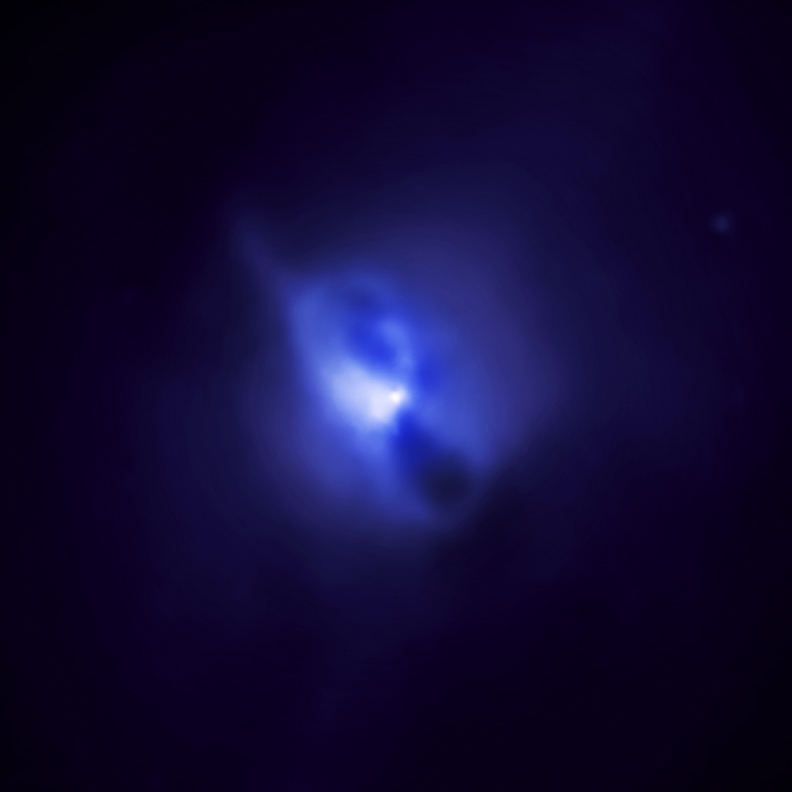 This composite image of the Hydra A galaxy cluster shows 10-million-degree gas observed by Chandra in blue and jets of radio emission observed by the Very Large Array in pink. Optical data (in yellow) from the Canada-France-Hawaii telescope and the Digitized Sky Survey shows galaxies in the cluster. Detailed analysis of the Chandra data shows that the gas located along the direction of the radio jets is enhanced in iron and other metals. Scientists think these elements have been produced by Type Ia supernova explosions in the large galaxy at the center of the cluster. A powerful outburst from the supermassive black hole then pushed the material outwards, over distances extending for almost 400,000 light years, extending beyond the region shown in this image. About 10 to 20 percent of the iron in the galaxy has been displaced, requiring a few percent of the total energy produced by the central black hole. Outbursts from the central, supermassive black hole have not only pushed elements outwards, but have created a series of cavities in the hot gas. As these jets blasted through the galaxy into the surrounding multimillion-degree intergalactic gas, they pushed the hot gas aside to create the cavities. A relatively recent outburst created a pair of cavities visible as dark regions in the Chandra image located around the radio emission. These cavities are so large they would be able to contain the entire Milky Way galaxy, but they are dwarfed by even larger cavities -- too faint to be visible in this image - created by earlier, more powerful outbursts from the black hole. The largest of these cavities is immense, extending for about 670,000 light years. Coordinates (J2000) RA 09h 18m 06s | Dec -12° 05´ 45"
Thanks for your question and yes, just because they're both dark doesn't mean that they're related to each other. They appear to have very different properties. Not only is one of them attractive and the other repulsive - as you mention - but one of them clumps (dark matter) and the other does not (dark energy). Like a bubble popping as it circles a drain? About the earlier comment on dark matter and dark energy: just because we can't see either diesnt make them related right? Dark energy is a force pushing matter apart while dark matter is a force holding it together. This is soooo super cool. ends up falling across the event horizon, but some is ejected in jets. This is on a firm observational footing. People like to say that black holes are "messy eaters". For more details, please see the links given in my post below. Thanks for the interesting comment. I'm not aware of work like this. Your idea that the jets originate from inside the event horizon does not sound physically possible. It would be great to have a theory that simultaneously explains dark energy, dark matter and black hole behavior, but I am skeptical that such a theory is currently within reach. I wander about supernovae if - except the case of the type la - instead of an explosion it is an implosion similar, but most violent to the case of the birth of the white dwarft or of the neutron stars. Can someone answer me? Thanks. Perhaps my english is not perfect, but I am Italian. I understand the standard idea for jet formation. Have you ever encountered anyone working on alternative ideas that posit the jets originate from within the event horizon being shot outward from a core rather than a singularity inside of the event horizon? I am studying a model where spacetime can flow. 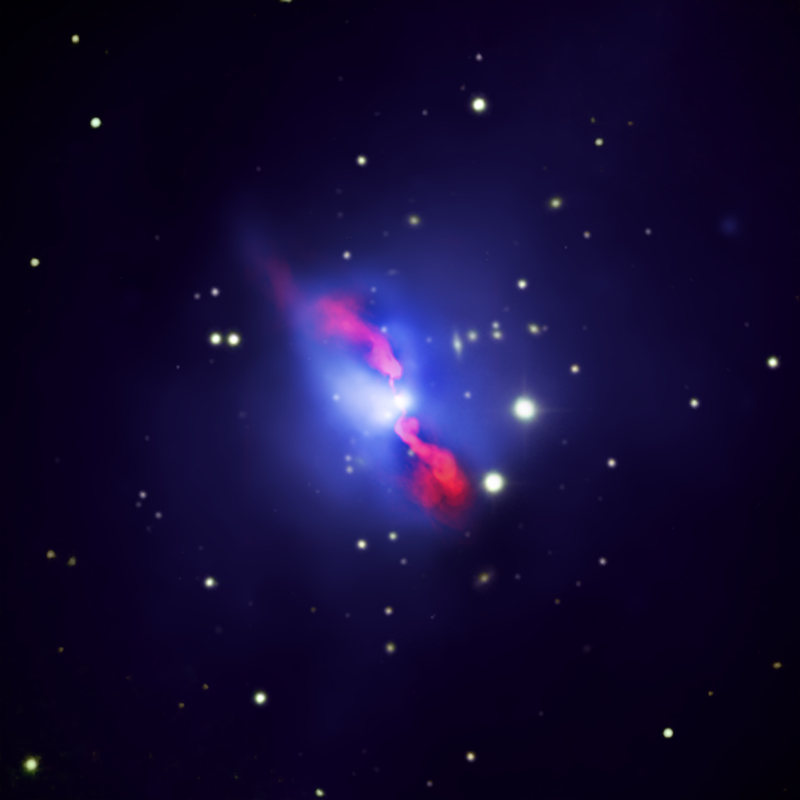 It addresses the dark matter and dark energy issues and as well sheds light on these jets. Rather than a singularity the model anticipates that at the center of a black hole's event horizon, spacetime flows in and rams into a standing shock front producing a core of what might be called spacetime condensate or quantum vacuum condensate. Too much angular momentum would allow that core to breach confinement and shoot outward as observed. Have you or anyone ever contemplated models where the jets originate inside of the event horizon ejected from a core a mini version of the Big Bang inflation era? Very interesting discussions put up here and my unasked questions were answered here. Thanks a lot. I do not understand the line in the last paragraph of the article. Outbursts from the central supermassive black hole have not only pushed elements outwards. How the elements pushed outwards? -Because we know that no element can escape from the strong gravitational force of a black hole. The mass of the black hole is estimated to be about 900 million times the mass of the Sun, which is big even by black hole standards. It's over 200 times the mass of the black hole in the center of our galaxy. The emission of this jets is so huge that just can be explained by the presence of the super massive black hole in the center. Thanks P. Edmonds and Bill Strowd for your contribution to explain more this phenomenon, that is really awesome. I just wanna ask you, what is the mass of this black hole that can produce this huge jets? A large number of supernovas can result in an outflow, but this wouldn't be nearly as focussed as jets observed in the radio. I agree with Mr. Lee's comment. The article reports outbursts from the supermassive b/h. A black hole which radiates gas jets outside. Can you better explain this phenomena? Thank-you very much indeed. Type Ia supernova do not produce blackholes. But they do result in production of expanding clouds enriched in iron as an end product of nuclear decay from a radioactive isotope of nickel, produced in the explosion, see link on Type 1a above. The radio jets and iron-rich gas are beamed along the magnetic poles of a supermassive blackhole's intense magnetic field. The gas was and is in the hole's vicinity from prior Type la supernova within the galactic nucleus. When the gas is pulled near the hole it is heated and then ejected by the field, also producing radio waves, but the matter does not come directly from within the black hole. Undoubtably the process involves much matter which does fall into the hole, but that portion is not visible. That contribution is how the hole grows to become super massive. Wouldn't the supermassive type 1a supernova, which then became a black hole, be what squirts out these jets of iron-rich matter? I'm still trying to get my head around the idea that matter rushing toward a black hole, because of the intense gravity could go anywhere but in. If the escape velocity is greater than the speed of light for photons that cannot escape, how would attracted matter have anyplace to go but in much less sprayed out in to radially distinct and superlatively enormous jets?